Last year I was using a helicopter variant as my maggot feeder rig, but changing hooklinks was a bit of a pain and I was never convinced that it was all that good a rig anyway. Although this one uses more components than I'd really like it is pretty simple, and easily converted to a straight leger rig. I don't like quick-change connectors between my main line and hooklink, preferring to retie the knot. It takes only a few seconds longer, ensures that the knot isn't neglected and makes the rig more streamlined. Click on the pictures to enlarge them. 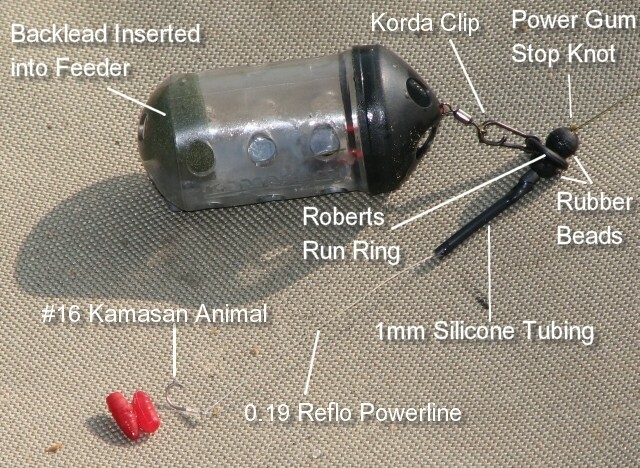 The feeder is a 30gm Kamasan Blackcap, and the backlead shoved inside it is around 30gm too. This makes for a feeder that flies well, is heavy enough to tighten up to without moving and which still sits horizontal on the lake bed. 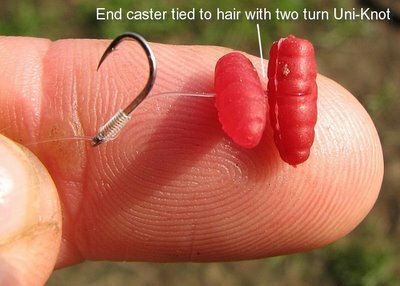 Using a sliding Powergum Stop Knot to trap the Run Ring between two beads makes the hooklink stand out from the main line on the cast, and gives me the option to quickly change to a free running rig should I so desire - by sliding the knot up the line a few feet. For what it's worth I have been using Daiwa Infinity Duo as mainline, in the 0.285 diameter. I quote the diameter because this line is IGFA rated at 12lb, so it will break below that. I have heard it said that Duo is bad for line twist, but I have actually found it to be less prone to twisting than Sensor. Maybe it's the fact that the two-tone colouration of the line that makest he line twist readily visible that has given Duo this reputation? It was the limpness of Duo that attracted me to it in the first place, and it has proved good in that respect once loaded on the reels, and it seems pretty abrasion resistant too. Reflo Powerline has been a good reliable hooklink material so far, in both 0.19 for the casters and 0.21 for corn. It's maybe not as limp as it could be in short lengths, but it is very clear and I can't see the need to delve into the murky world of fluorocarbons when this stuff is avialable. One thing I don't like about using plastic baits is trapping them on the hair using a bait stop. It looks kind of clumsy, although I know full well it doesn't put the fish off. Even so I have had problems with artificial baits falling off the hair, so when using casters and pellets I tie them on to the hair. That way they ain't going nowhere! While I have read that Kamasan Animals are not particularly sharp hooks, my experience has been different. Even so, it's no great hardship to run a file over a hook if the point is not up to snuff. When I want to use a small hook the Animal is the one I go for. So that's about it. Maybe not the most exciting rig, but it seems to work well enough.